the ability to feel pain, caused by stimulation of a nociceptor. Physiologically, it is composed of four processes: transduction, transmission, modulation, and perception. Called also pain sense, algesia, and algesthesia. 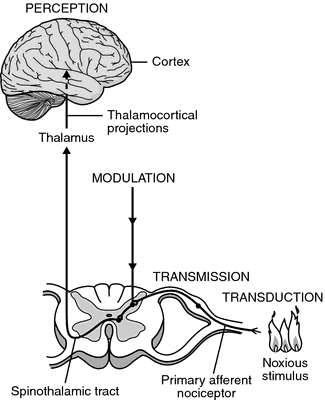 The four processes that make up nociception: transduction, transmission, modulation, and perception. From Ferrante and VadeBoncouer, 1993. The perception of pain, resulting from neural processing of pain stimuli. n awareness of tissue injury. perception of a painful stimulus. Thermal Nociception (Hot Plate Test) The hot plate model was used for the evaluation of the central anti-nociceptive potential of viscosine. 1997) including nociception, and short-term ether exposure provokes stress associated with rapid and marked increase in the plasma levels of corticosterone (NASCIMENTO CURI et al. Nociception in vertebrates: key receptors participating in spinal mechanisms of chronic pain in animals. As a result, while some investigators focused on muscle pathology and nociception, others investigated mechanisms that affected muscle pathology such as sleep. Kidd et al: Inflammatory mediators and nociception in arthritis. Parthenolide inhibits nociception and neurogenic vasodilatation in the trigeminovascular system by targeting the TRPA1 channel. There was loss of temperature discrimination and nociception in distal lower limbs. Schnakers and coworkers (2010) have developed a Nociception Coma Scale specifically for assessing, monitoring, and communicating possible perception of pain in patients with DOCs after coma. Human studies of melatonin with relation to nociception have been limited. 6) Nociception arising from axial tissues is more likely to initiate central sensitization than peripheral tissues and it is has been suggested that spinal pathomechanics produces changes in dorsal horn excitability. Another likely mechanism of action is altered nociception.